These steps lead down into the stream. My husband uses them when he has to get in to clear weeds from the stream bed. I just look at them! These are so pretty. A neat idea. Did you plant seeds in the cracks of the steps? How did this arrangement come about? I'm so sorry I posted this twice - not sure how! No, the plants just grew there naturally. I think there's a small amount of silt left from when the stream floods, enough for the plants to take hold. They survive being submarine plants sometimes, too! This is very attractive, Spritz. I am intending to try to get something growing along the bottom step, too - but husband filled all the gaps very well, so I may not succeed. I think I saw a post a while ago when you were having all the water troubles and you wrote of the steps and the flowers growing in the niches...nice to see it in bloom!! lovely feature. Wonderfully natural and a lovely mix of colours. There is nothing more beautifuly than natural planting! Is it Aubritia or companula the blue, I am surprised to see primroses growing out of the cracks. The old stone makes a lovely setting. It's aubrieta - but thanks for the idea! 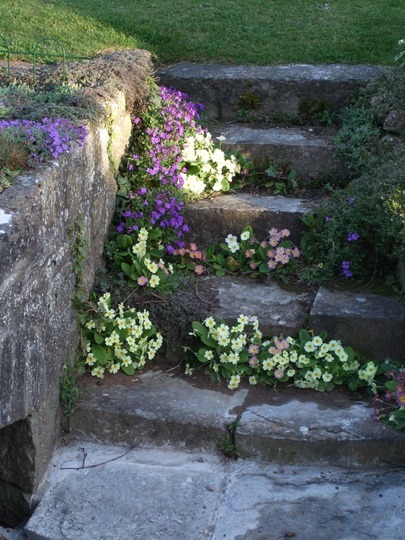 A spreading campanula would be a good one to try to establish on the bottom step! You are right, it could be VERY old stone. No idea how long the steps have been there. How lovely to have such beautiful old steps, a treasure to begin with and then the plants growing in the cracks, wonderful. Yes, I look at the old stones of the house and steps and the bridge and think of all the history they've seen! King Henry the 8th was on the throne - or was it H the 7th - when the house was built! How lucky for you to have such history in your garden. Very nice, Spritz. The stone shows off the primroses very well. Wish we had a stream. It's lovely when it just burbles along, but after heavy rain when it rises...and rises...and floods the lower lawn, I get twitchy! The village gets cut off as this stream goes right through it - there's a ford about 20 yards from our gate. Was it between 1485 and 1509, Spritz? Course we know what lies on the other side of the Bristol Channel...maybe one of Henry Tudor's allies or family lived there? Do you have access to copies of old land deeds? What is it like to live in a place with such history? I think you are very lucky...but perhaps you have pause to consider when the water is rising!? Yes - it has been dated at 1508. We have had a historical survey done and know a whole lot about who lived here... it was a Yeoman Farmer, well-off - the signs are there if you know what to look for! Obviously a lot has changed - originally it was thatched. Our deeds are in the County Archives. We haven't actuallty seen them, only the more modern ones as far back as the early 1900s. We both feel very, very lucky to live here. We love it! Just precious! It's amazing how it self seeded. Nature never stops amazing me. Are the primroses wild ones? I have wild primroses growing by my brook Spritz - they must like the wet conditions. They self seed all over the place and are such a vibrant yellow. If the bottom step is the most likely to flood, how about water forget-me-not there? We had that actually in the stream, Andrew - but husband has to clear the bed of the stream out regularly and it went! Today he has drilled some holes in the cement so I can squeeeeeze in two or three small plants! one will be a Campanula and the other I think will be my Erigeron karvinskanus. I don't think the water forget-me-not would be small enough for the holes! Yes, Dawn - they are wild primroses. Hi there Spritz... I think this is the lovliest photo I have seen on here and there are some real beauties... i have steps too ...their history?? slabs and logs about 18 months ago!!! I have tried to plant small pots of campanulas/aubretia but there doesn't seem to be enough soil, if any, to sustain them... it never occurred to me to try seeds, i may have more luck with a drill and a packet.... you are inspirational, as always! Thank you - what a lovely compliment! Your steps are beautiful and you are an inspiration to me. Next summer I will try planting on the edges of the steps. Can't do the middle as we walk on these a lot, buy what a great idea. I'm glad you found this, Valerie - I love my steps, and I'm glad you'd like to do the same in your garden! just found this website and asked advice on brightening up my old,slippy,steep,narrow,v. old,utterly beautiful quartz veined steps leading to my postage stamp of concrete,surrounded by 20ft high walls and single basement flat door into my cavern/cave of a dwelling!Ha,only a stream u have....when it rains heavily here in the british riviera my steps transform into niagra falls,then filling the yard,11inches deep last time,and undeterred by a 3inch step it continues to create a stream down the now carpetless hall,maybe mangrove or bullrushes are my best bet! p.s. your natural,country flower waterfall is stunning,i would be scrutinizing any footfall near it lest they dare to crush so much as a tendril,more beautiful than any carefully planned regimentally placed flowerbed.do u sell cuttings? better still,lets swap steps!